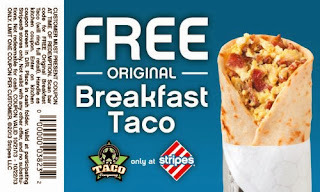 Get a free breakfast taco @ Stripes. Click the link below to go print the coupon. Take the coupon in to your nearest Stripes to redeem it. Hurry Valid today & tomorrow 10/21/13-10/22/13 only!